We've all see it - The main character in the Animatronic suit is running around and on the side is his team of trusted R/C controllers. But - What happens if you are only the actor and you want to do the same. And even worst you are in a non-scripted ad-hoc environment - The Public!!! Yes - you can pre-program sequences into a microcontroller BUT how do you then control it without been seen to be pushing buttons etc. How does it work? A mold is made of the actor's pallette and a small resin shield is made. On the resin sheild you place Hall Effect devices and a resistor network. This is so that whenever a single Hall Effect device is activates you can see a change in voltage on the output wire. Cover this in resin to insulate. The actor can wear this (only 3 wires coming off it is needed) and it is attached to the A/D side of a microcontroller that will monitor the voltage changes. I use denture paste to hold mine in the roof of my mouth. By gluing a tiny piece of fridge magnet (yes - the Hall Effect's units are THAT sensitive) to the tip of the actors tongue they can then press this against any off the Hall Effect devices and thus send a command to the controller. Fridge Magnets are safe.. It is when you accidentally ingest rare-earth magnets that the problem occur. On my unit pictures below I also added an earphone unit to give an audio feedback of what was pressed but that can easily be set externally to it. It's small, lightweight, easy to get used to.. and I can control 8 switches.. or 7 and use the center one as an emergency STOP!!!! For example a PicAxe 08M2 for $4 is perfect for the controller for this. With more work it can even be totally inside the actors' mouth and use bluetooth/rf to send signals removing any need for wires. Thanks. This I'd the end of a long series of experiments. That does sound like a fun project and is perfect for a way of controlling your dragon without others realizing that your doing it. I did look at a couple of ways including gloves.. But it really comes down to some sort of adhesion. This can be with a implant/tongue stud... or gluing. As the magnet is best on the tip of the tongue it makes it additionally difficult as the tongue can distort it's shape so much. I have finished it and done some test - it works very well. The coil and board at the top is the power supply being an Induction Charging system. It is presses against the cheek on the outside above where the receiver module is. A regulator to even the voltage to 5v. 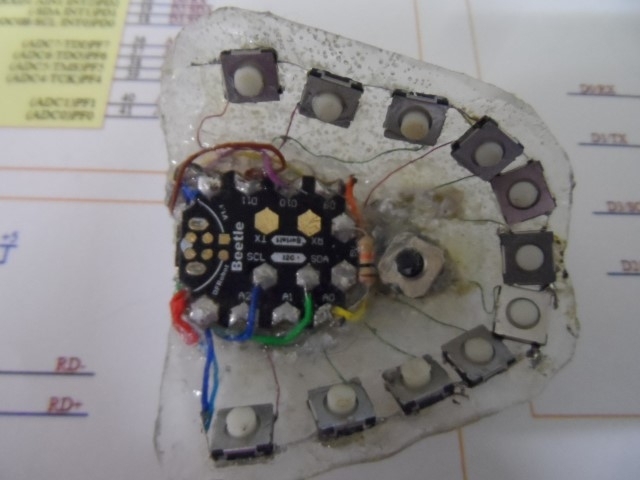 A SMD PicAxe 08M that reads the voltage from the palette shield and encoded it. The corresponding micro reciever is a single small board and can be hooked to any microcontroller. The range is about 10 to 30 feet. For my use it in incorporated into the electronics in the underskull. On the right is the palette shield as described in the first part of my article. I removed the audio feedback as I could not hear it that well so all notifications will be handles outside with an earpiece. As said - it works well but I am still trying to find an easy way to temporarily attack a small magnetic disk to the tongue tip. The disk can be a circle of fridge magnets so that it is of low enought field not to cause issues if ingested unlike the rare earth magnets. Thats awesome David! any videos? Not yet.. But I am working on it. Currently waiting for a friend to pop around so I can get a cast of my face so I can build up a shield for the charger side, as well ad a mound for the heads-up display, the lip syncing sytem, and the eyebrow sensors. That is a great solution. Though I can see how the magnet glued to the tongue could cause some concerns and discomfort. My first thought would be to use a small analog joystick that would be gripped between the teeth and controlled via the tongue. It could also have an additional button that detects when the teeth bite down on the base to add additional functionality. 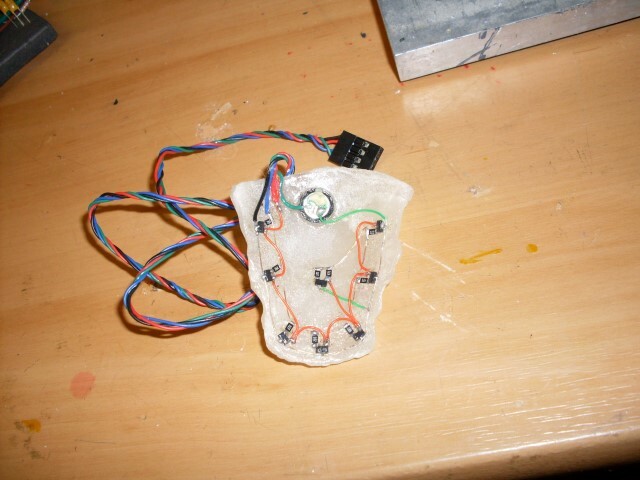 With the joystick you would have 4 main directions to trigger off (you could use more directions but accuracy may be a challenge), and you could even use the bite switch as a function key to turn 4 directions into 8 commands depending on if the bite switch is open/closed. If a slight delay (500ms or so) in the system is an option, you can even have different functions for how many times the joystick moves in a specific direction. Example: 1 move left = effect 1, 2 moves left = effect 2. Optionally (and I like this option the best) you could use the bite switch to toggle between modes. 1 bite = mode 1, 2 bites = mode 2, 3 bites = mode 3, etc. 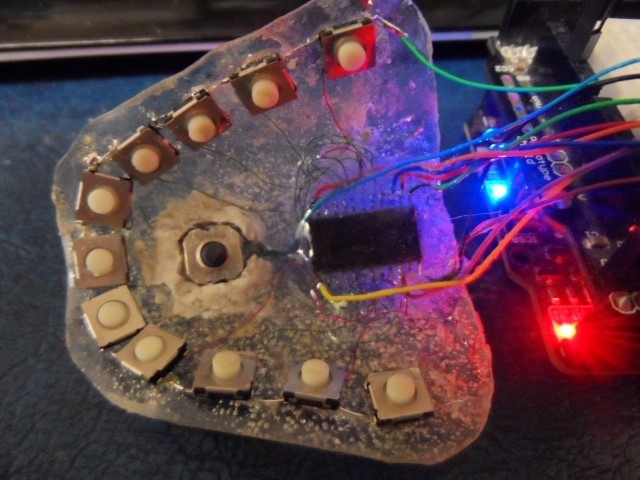 Active mode could be indicated by a RGB LED inside the mask, piezo speaker, or haptic vibration. Each mode could have a different layout of effects mapped to joystick direction, and you could even have modes where the joystick provides 1 to 1 analog control over a function like head or eye movement. I would do some research into accessibility devices for the disabled, as there is a lot of research and development in that field that could be leveraged. Again, brilliant solution with the hall effect sensors. very nice concept & interface, I like it having almost no moving no moving parts although Chris joistick id would work very wel if done wel. or make something similar, hope it helps. Thanks for sharing! Great idea! So rad to see it was made into a reality! Thanks Kee for that link. I've been refining my idea's again (Yeah - I'm an inventor) and I realized that I can get very small - 1.4inch x 1.4inch resistive touch pads. If one of those was mounted on the pallet plate then I can use the tongue's pressure to activate it. The resistive unit act like 2 variable wisistors in an X/Y co-ord. When pressure is applied to a point a reading can be taken. This does have some advantages. 3. It only works on pressure so casual touches will not activate it. 4. NO modification to the use's tongue is required. 5. If necessary reference 'bumps' can easily be applied to the flat screen. Flexible screens may come later to better fit the mouth structure. I am awaiting the touch screens to arrive from China where I will start to experiment some more. and a mouth shield one can quickly get something set up. Currently I'm experimenting with types of plastic and vacuum molding for the mouth insert. Since these are a resistive sensor - not a switch- one can adjust the sensitivities on the A/D side to detect between a casual brush and a definitive pressure. Using a multiplexer (4051 or DG408) you can quickly scan through each of the sensors and send the output to the A/D pin of an Arduino or similar. With a little unit like this http://www.rfduino.com/ the unit can be totally self contained in the mouth with the battery sitting in the cheek. For previous experiments - the touchscreens - although I did get a limit success - proved to be too uncomfortable because of their width, plus the concept of a glass plate in my mouth proved to be too unsettling. But I was able to track movements. Very cool. I really dig the RFduino, may have to pick one up to play with. With the RFDuino - You will need a BLE Dongle. Normal Bluetooth won't work. That is a 5 way navigation switch between the front and the IC. All in total 16 separate that can used for any function. Switches are from Panasonic and have a very light tough and a definite tactile click. The 6 at the back have a little longer stem than the one at the front. For you tech guys - the embedded IC is a 74HC4067 - a 16 to 1 analogue multiplexer. One side of every switch is tied to ground and the other to an input on the IC. 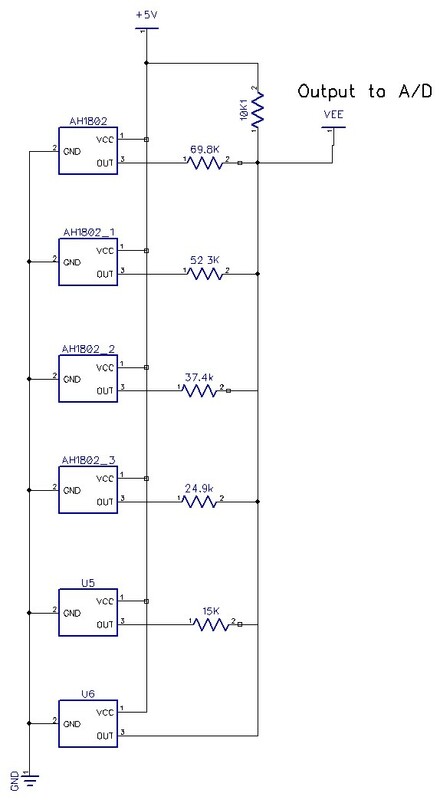 The output of the IC is pulled HIGH and is connected to an A/D pin on the Arduino. Each time a switch is pressed the line is pulled LOW and then the Arduino can read the value. Normally the reading is 255, and when a button was pressed it read 6 or so. A DFRobot Beetle will be mounted ontop of the chip and will have 4 wired exiting from the side of the users mouth. Power and Serial. 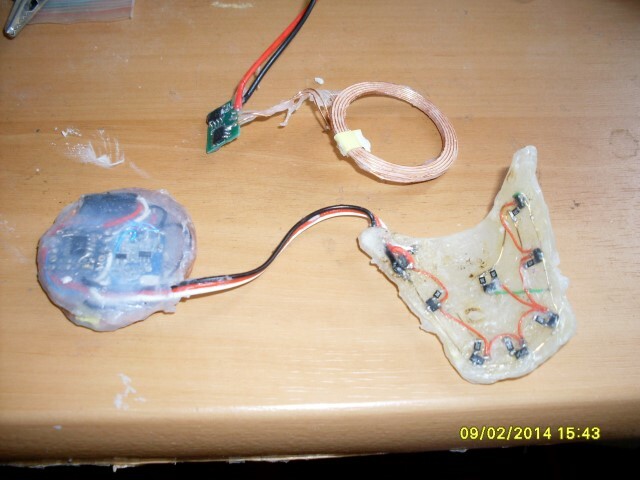 If I wanted to have everything internal then I can use a RFDuino and have a LiPo in the cheek cavity. Wow, that's looking awesome. How do those switches hold up to moisture? It will hold up pretty well to casual moisture however I plan to give the switches etc a light silicone coating as well. The switches are partially sealed but not water tight. In addition a quick spray of a wax release product would also work. Version 3 is FINISHED. Just doing the programming before soldering on the final wires and encapsulating the works in a coating of silicone. I used a RFDuino Beetle (Arduino) for the brain because of it's size. 11 buttons PLUS 5 way joystick - all invisibly controlled by your tongue. And you can still talk/drink etc. Version 4 is already in the design stage. It will be fully self contained and chat via Bluetooth. In addition it will also run on tiny lipo's or coin cells due to it's very low power requirements. Might want to put a thin material down over each switch before encapsulating (like small squares of cellophane) so the silicone does not leach down into the mechanics of the switches and lock them up. Can't wait to see where you take this next! This is a really neat idea for controlling things independent of spotters/puppeteers. Keep up the good work. I'd...rather not have a LiPo in my mouth. That just seems a bit unwise. Sadly I have offered the concept to several groups. They are interested but want "A Working Prototype" before committing anything. The problem is that I am at the stage where I need some investment re getting multi-layer boards etc. I'll still push the idea forward for my own interests. Current status - evaluating ways to make a ultra-micro proportional joystick that will be water proof, self centering, as well as being sensitive enough to use with a tongue. It also needs to have a switch on top. I know it's been a while but I have been dragged to other projects for too long a while. I am always keeping my eyes open re new tech and capabilities. Nice thing is it's tiny but not too tiny to solder wires on to. You may also want to look into the NRF52 chip for small radio communication. I've been wanting to play with one for a while! Yes - that does look interesting and one can solder the unit by hand if needed. There is a deluge of small SOC BLE chips coming out at the moment and all of them look exciting. Even Adafruit has a dev board for it..